Celebration Station partners with Tri-County Literacy to provide GED classes to the residence of Chicora-Cherokee community of North Charleston and the surrounding area. 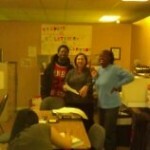 We provide GED classes, free of charge, four days per week from 9 AM to Noon. Before entering a student is tested to determine at what level they need to start their GED studies and at completion of studies they take their GED test. We also have a computer lab in which Trident Literacy provides online GED studies, as well as the state program, “Work Keys” to develop certain knowledge base skills for different employers throughout the state. Celebration Station also provides online assistance in seeking jobs, setting up e-mail accounts and helping with resumes.